I have been an athlete as far back as I can remember. I started swimming competitively in the summer at the age of five and at the age of nine I began swimming year-round. As a teenager, I began running competitively as well. I ran collegiately and began racing triathlons professionally a year after graduating college. I have had many, many coaches over my nearly 25 year athletic career. I have learned important skills and qualities about myself and sport from each coach. Once I started racing triathlon professionally, I realized how important it is to pay attention to the details in and out of training. My current coach, my husband Nate, has helped me to realize that what I do outside of training can have a direct correlation to my performance in training and in racing. Nate has helped me find a balance between training, racing, and being a mom. I have realized at times that more work is not always better! This has been really important as our daughter Caroline is now 3 and she is not the best sleeper. This means that sometimes recovery has not happened from day to day. Nate lays out a plan at the beginning of each week knowing what I need to accomplish. If the recovery does not happen, he simply adjusts my days to fit in the training that works best for me. This way, I can still accomplish my training and racing goals from day to day, week to week, and month to month. It is important to have balance in what you do and know when to take a much needed physical and mental break from training and racing stress. Prior to having a coach monitor my training, I would often become over-trained and overly fatigued. I would ignore warning signs telling my body I needed a break and push through training sessions. Having Nate by my side and monitoring my daily progress by tracking my Acute and Chronic Training Load along with life stressors, I can avoid those periods of over-reaching and achieve the highest training gains prior to pushing too far and causing illness or injury. I find that open communication is key to any coaching relationship and having such ease of communication with my coach helps tremendously on the day to day training. The most important factor of my training is an open dialogue about my fatigue level, how I felt during my training session and comparing my thoughts to the data from the workout. It is the fine balance of monitoring the art with the science and that is the beauty of coach/athlete relationship. In my sport, the logistics of navigating the race course can be a challenge. I rely on Nate to help me with course maps, transition zones, and to be confident with what I will be executing on race day. It helps tremendously having a coach with me on race day who can help me with outside stressors and let me focus on your key race goals. During the race, it’s invaluable to have him on the sidelines, giving me physical and mental pointers to help me get the most out of myself on the race course. After the race, it’s always important to get honest feedback, both on racing strengths and weaknesses that I can take with me to become a stronger athlete in the next race. Thank your coach by creating a #ThanksCoach message or find a coach to help you achieve your goals. 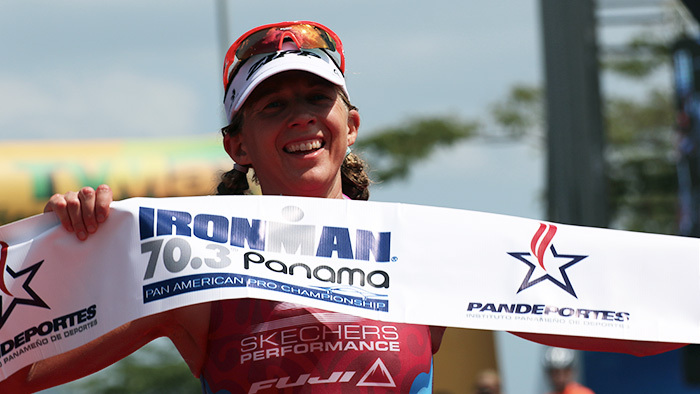 Sarah Haskins is a professional triathlete, two-time Olympian, and mother based in Clermont, Florida. Over her 12 year career she has won some of the biggest races in the sport including two National Championships and a silver medal at the World Championships. She is coached by her husband Nate, who owns Tri-K Coaching. Follow her at @sarahhaskinstri.